Everyone would love to see themselves happy in their career path. This is sometimes evident in some people’s lives. People on a job spend almost 40 hours of their time per week. Most of their day is spent at the office. This time that you spend there must give your happiness. Without happiness your health and your relations with your friends or family is affected. Imagine going to a work place where you dread working and feel very distracted or stressed out. Such a situation will only create frustration on the whole and will not allow yourself to be productive. 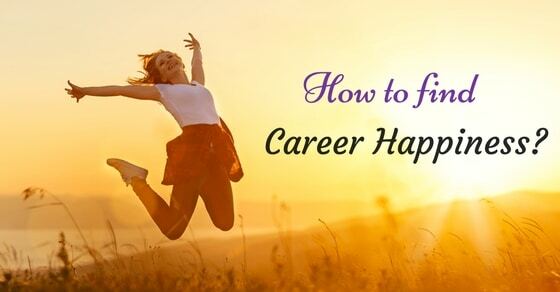 Here we have discussed few tips to find career happiness at work. By getting to know what your interest is, you will be able to choose your career. If you like your career then you would experience the following. You will not feel stressed to do any work. Every day you will look forward to the next day assignments. You would take initiative for learning something new. You will consider your work to be easy. You will always talk about it to your friends. You would pre-plan for the next day itself. You will want to sacrifice your time in case of extra working hours. You will enjoy doing your work. You will get deeply engrossed that you would not notice the time. So decide before you leap!! Sometimes, you land up in a job that you are not much interested but for the sake of making money you have no other choice. Then you must learn to love your work or job that you had opted. Even though you don’t like it, make yourself to like the job so that you don’t get stressed out and frustrated. Try to enhance yourself or motivate yourself to think that you would be successful even in this job. By helping yourself you would make more room for likely promotions that could be offered!! Not many are having the privilege of getting their dream job. Many of them take up jobs to support their families, getting better livelihood or improving their situations. Whatever be the job that you have chosen, look at it with different view and enjoy doing every bit of it. You have to train yourself to ” enjoy”. This is the way to motivate and make yourself to enjoy doing your work or else you would eventually be liable to make errors. It does not end with that. You would not look forward to go to work and there will a sense of negativity creeping into you. Look at work with a positivity and surely you would be rewarded in due course of time! Only by enjoying you will show diligence and creativity in your career! Happiness in a career is not always correlated with ‘money’. Most of them do but it would be ridiculous to relate with money. Being successful does not mean having more money. Happiness is what you love to do and have the inner urge to do it. There is passion in every one to do certain functions or something that is of ‘special interest’. Those special interests, no matter whether it is trivial, gives you happiness or joy to your inner self this is what you need to aim for. Though some of them get good pay they don’t like their work and get stuck in that for years. Their immediate requirements gets fulfilled and get accustomed to that type of living. They don’t reconsider other ways of living. Mistakes are liable to happen at your work place. It is better to not repeating those mistakes when you encounter. This will show that you have concern for your work and making effort to take a step ahead in learning. In due course of time, you would become familiar with your work and love to move ahead. There are instances where you will need to meet obligations and to fulfill the obligations you could negotiate for addressing your concerns. It could be asking for adjustment of working timings to meet your personal needs which is termed as flexi-timing, provision of transportation, adjustments of work place / table etc. This can make you more comfortable and enjoy your work. You would just have to put it in such a way that your boss would say “Yes”!! Each person would been assigned work according to their skill sets. Depending on the quality and accuracy of work, such persons are rewarded. In case you have not been given so, then look at your work done and question yourself first about where it went wrong or what was the drawback in your work? Then you must look out for the ‘missing factors’ and strive to achieve them instead of grudging over it. You will lose your confidence shortly! Many a times there are people, often complaining about the work or job. You need to realize that once you have chosen to work you have agreed to the terms of work. Don’t be a complain box, instead try to look for alternatives in the same work which will make you satisfied and comfortable. Its best to review the complaint asking yourself what is that you are looking out and find a solution yourself. This will keep your mind and heart at peace! It’s better to make yourself have habit of showing gestures of kindness, appreciation for small accomplishments, completed tasks to make yourself happy. These small tips will help to lift up your spirits for the day!! Besides not many have the same privilege of having a chance to work as you have , so be happy. A workplace is like being in a large joint family with different members of different attitudes. If you are able to maintain proper relationship with all your co-workers then work place will not be a dreaded place. You could suggest for bringing homemade lunch every week or have a gathering outside your office along with your family. It is to help you know your co-workers better and strengthen your relationship. Bet you would love to come back every day to work! You cannot move ahead if you are jealous of your friend or for what he/she has. Instead your focus should be to find out what did they do to achieve such heights. Jealous is poison that will spread to your whole body and will not allow you to think positively or try to think about alternative ways to forge ahead in your life. This in due course of time will shatter your happiness!! Treating yourself is a nice way of saying to yourself ”You have done a wonderful job” by having a cup of ice cream or to have or a bar of chocolate that you love or doing something that you would like. Whatever be it, you will need to occasionally treat yourself with something that you love to. Compare yourself a few years back and situation now. See the different paths you have taken to reach this height of your career. By your flashback you would realize that you have done well through that journey and need to appreciate yourself for the efforts, hardships, sacrifices you had done. There would be immense happiness once you realize how far you have reached. Most of you would be having designated locker or desk or cubicle. To liven up or brighten up your workspace, you could hang in your last vacation picture, or your children’s hand drawings, or a small flowered plant or writing quotes every week on the board in front of you etc. There are many such ways to brighten your day by personalising your space. You might not have landed on job that you dreamed of but you have got a job that you might enjoy doing. In such cases it’s better to reconsider your options and try to satisfy and make yourself feel contended with. In case you have strong urge to move to another job, do so but ensure that you have enough financial support before you leave and get another one. Every human being needs to share their views or thoughts. Sharing your views or opinions or thoughts with co-workers will help to bring solutions to a problem that needs to be fixed or will help to gain knowledge. You cannot consider gossip as being under this category! By practising yoga and meditation, you would keep your mind and body in synchronisation with your thoughts. There is no room for negative thoughts. Doing exercise is one form of keeping your mind and body fit. This will help to rejuvenate your mind! Try it out yourself to experience the same. It helps to look forward each day with a fresh mind. Smile is a sign of joy. Smile every day at all around you and you would feel the difference it creates. It not only makes you feel happy but also gives a sense of positivity. Smile has a hundred words to it and basket full of happiness. You will not only bring joy to yourself as a person but also bring in friendships. All work places or jobs do give breaks to their workers in the form of holidays or vacations. To bring happiness to your work look forward to your holidays and plan a trip with your loved ones to a far off city or holiday spot or even a family gathering. Such breaks are always rejuvenator to the self. It not only freshens us up but also help us to focus on our work much better once back. 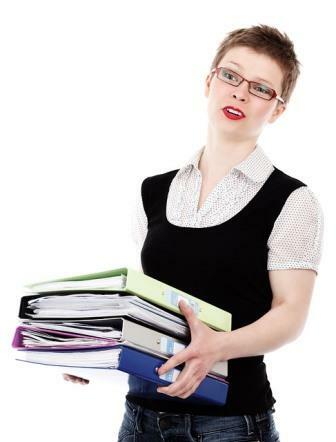 In the fast paced world, everyone wants to get an extra buck by being able to handle more than 2 or 3 tasks at a time. By agreeing to such tasks, we overwhelm ourselves with task of completing it on time and forget the small happiness that lies ahead of us. By doing so you could get trapped in the mundane tasks which could lead you to sleepless nights!! This would eventually destroy your happiness. People are often worried about what the future has in hold for them and forget to enjoy or cherish the moments lying before them. Too much worrying about the future will only ruin your happiness. Whether you are going to get the desired promotion as per norms or are you going to be selected for the highest position is not to be worried about. It surely hampers your joy. It’s better to surround ourselves with positive people as there is positivity in our way of approach towards all matters related to the work. Such positivity will create general happiness in our surroundings as well. As man is a social being, he/she cannot survive for long in any workplace. You will need to develop friendship with co-workers. 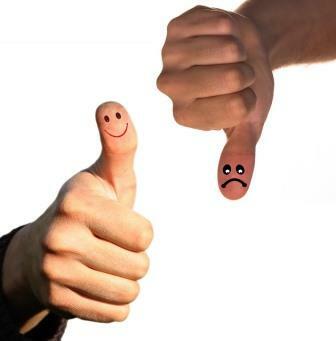 By having friends you would be sharing a few views or opinions rather than being aloof. It generates a sense of joy around the workplace. By helping others to learn the subject there is a sense of immense joy that you have accomplished something great like climbing the Himalaya! Its always seen that when one teaches the other person about a new concept or new idea they feel proud about it and give joy. You could also develop this habit to teach. Having a habit of drawing something on paper or gardening, painting, making crafts, writing poetry or books, etc. are hobbies that many pursue. You too could pursue your interests after office working hours to keep you happy. Diet is one of the main components of happiness. Would you be happy if you had a pain in your leg every day at work. By maintaining a proper diet, you would be keeping yourself fit. 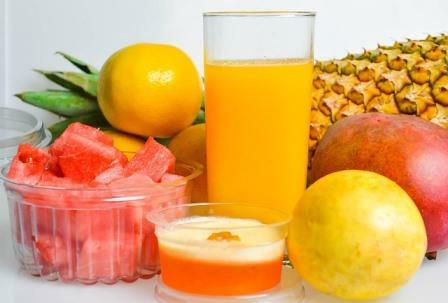 Drink lots of water, eat fresh fruits everyday, avoid fast foods and eat high fibre food. This will help in proper digestion and help you to wake up fresh every morning! You would be happy if you have necessary time out with your family. To keep you happy it is necessary to have the right balance between your family and work. Don’t carry your work home and do it there. Instead complete your work at work place and spend time at home with your family. Make it a habit to wind up work assignments at work place. You could go over the next day and complete them with fresh mind. 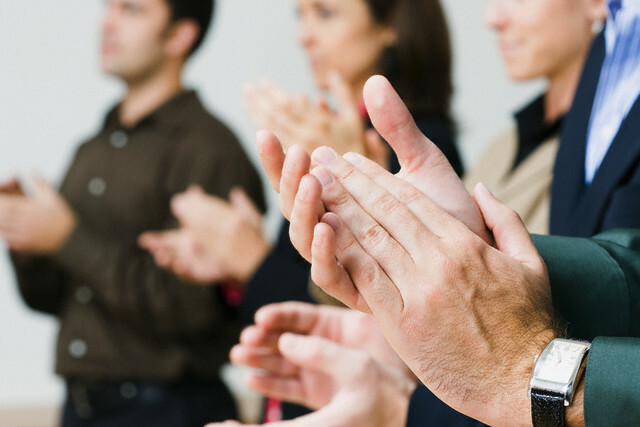 Compliment your colleagues or your team for the great effort they had put up with and you will see how much happy you would feel inside of you. Not only that, you will generate a positive environment around you and everyone will in turn show more trust towards your words. After a long day at work, listening to music can refresh you and help to do your work with more concentration the next day. Music has the power of healing and soothing the aggressive mind. By listening to music the stress is removed and body becomes relaxed. Relaxed mind will be able to think more and generate ideas. Hence, make it habit to listen to soft music and experience the difference!! All of us love to play games. Are you interested in playing outdoor games or indoor games? Whatever be it, try to take some time off for yourself and play games that interest you. It could be tennis, football, carrom, chess, jigsaw puzzles, Sudoku etc. Anything that relaxes your mind and that you love to do!! Applying at least few of the above to your life will surely bring in much happiness. You would need to absorb them into your thoughts and see how to implement them within yourself. If you have been practicing some of them, then well done. If not then try to read them carefully understand and adopt them or practice by implementing them into your life to create happiness within you and around you. This requires a lot of will power and determination if you intend to make and keep yourself happy in your career.